I decided to make French macaroons prior to researching how to actually make them. They look so delicate and beautiful but it turns out they are a bit of a faff to make. There are many, many ways in which you can muck it up. However, I had challenged myself and so I made some and they were lovely! I followed the advice of Ann Reardon on the howtocookthat blog. 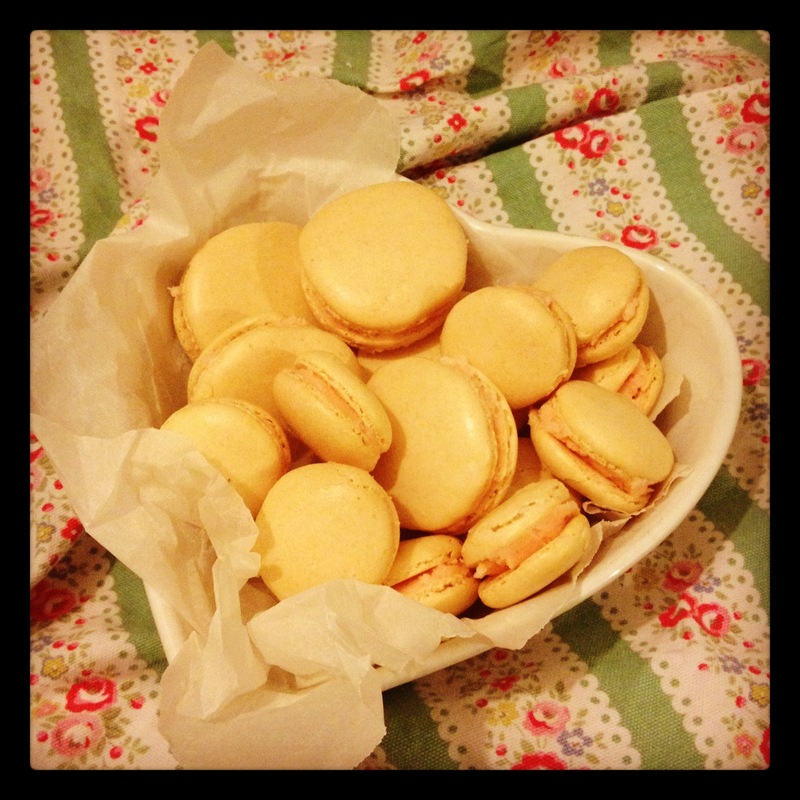 There is detailed information (videos and plenty of pictures) about how to make the perfect macaroon. I decided to make plain macaroons and add my own twist with a rose buttercream filling. I was pleased with my efforts (they all went!) but I think the art of the French macaroon is one that I need to practice. The recipe makes quite alot of macaroons. I ended up with 4 baking trays worth. Next time I will probably halve it. Place egg whites and cater sugar in a bowl and mix with electric mixer for 8-10 minutes. Add gel food colouring and continue to mix for a further 30seconds. The mixture should look stiff and dry. Sift the almond meal and icing sugar and salt twice, discarding any almond lumps that are too big to pass through the sieve. Fold into the egg white mixture. It should take roughly 50 folds until the mixture is smooth and a very viscous liquid, not runny. Over-mix and your macaroons will be flat and have no foot, under mix and they will not be smooth on top. Pipe onto trays lined with baking paper, rap trays on the worktop firmly (this prevents cracking) and then bake in the oven for 20 minutes. Check if one comes off the tray cleanly, if not bake for longer – if they are looking done on top move to the bottom shelf of the oven for the remaining time to help bake the base. Mix the butter, icing sugar and colouring together until smooth. Add the rosewater 2tsp at a time to your preferred taste – I used about 6.